Interlocutor: To finish the session I will ask you about the "Mad Cow Disease". Ruanel: The Mad Cow Disease affected their decoder and they believed they were sheep. Interlocutor: ??? Master, I almost fall into the trap, don't make those jokes! Ruanel: What? Do you want me to be always serious? Interlocutor: No, it is fine, but I will clarify at once that it was a joke because I can believe it and later on I’d be ashamed. Ruanel: The Mad Cow Disease is a Virosic problem that attacks to their nervous system. Interlocutor: Have they found a solution? I ask it because I didn't deepen a lot in the topic. Interlocutor: And how did it appear? Ruanel: The virus was injected directly by extraterrestrials. Ruanel: But it is something logical! If it were a terrestrial virus the scientists would have already have “kicked the ball", so to speak. Interlocutor: I am completely astounded. Ruanel: There were cows inoculated to experiment and the illness spread in this way. Interlocutor: What is this experiment about? Ruanel: They seek to find out how the antibodies fight against a viral invasion that affects all the nervous extremities of the bovine livestock. Interlocutor: Concretely, the virus was inoculated in the cows by extraterrestrial, but Is the virus terrestrial or extraterrestrial? Ruanel: The virus, as I said, it’s not terrestrial, because if it were terrestrial they who investigate would have already found the way of reverting the illness. Interlocutor: Could we give some information to help the terrestrial scientists? Ruanel: The issue is that when it’s viral what they should have to modify is all that have to do with DNA. If the terrestrial scientists investigated more the topic of DNA, As it has already been said numerous times regarding to terrestrial illnesses, they would revert 99% of the illnesses of animals and humans. Interlocutor: Where do these aliens come from? Ruanel: They come from a stellar system called Procyon, almost closer to ours, because it is approximately 11 light years. Interlocutor: Do these aliens continue here? Interlocutor: Do they only have a base in their ship or also in the terrestrial surface? Ruanel: They have bases located in the American continent. Ruanel: No, at this time they don't have any base in Europe. Interlocutor: Are there bases in the lakes? Ruanel: They are more in the mountains. Interlocutor: Do they continue infecting the cows or the experiment is over? Interlocutor: Where did they originate the illness? Ruanel: In all the part of Great Britain. Interlocutor: Did these aliens come here in the same time in which they infected the cows? Ruanel: No, they came here 14 years ago, approximately in 1991. Interlocutor: Did the infection then appear much later, when they were already settled down here? Interlocutor: Concretely, then, Why do these aliens make this experiments? Ruanel: They want to obtain antibodies to manufacture their own vaccines. Interlocutor: The cows infect to each other? I ask it to know if the disease is transferable without the inoculation. Interlocutor: Is the illness increasing in these moments? Ruanel: Yes, it is increasing. It had been reduced but now it’s spreading again, from the 2003 to this moment. Interlocutor: Is it because the aliens are injecting the virus again or directly the illness is spreading through infection? Ruanel: Fundamentally, the aliens are inoculating the virus again. Interlocutor: Are there cases in America also? I ask it because I don't remember to have read about this. Ruanel: Yes, there are cases also, but they have not given so much importance to them. Interlocutor: And why do these aliens cause so many problems to us? Why don’t they make their experiments directly in their ship or in their bases on Earth? Ruanel: Because they don't care about humans, neither what they think nor what can happen to them. 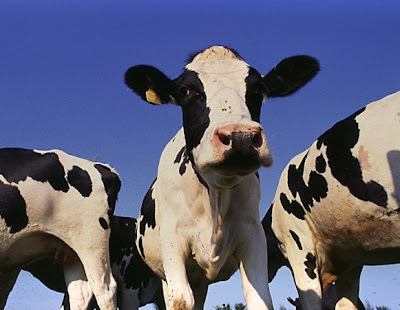 Interlocutor: Can Mad Cow disease be contagious to man? Ruanel: Yes, it can infect him. There are no cases convincingly proven, although there are scientists that say there are. There are problems to trade their meat and all of that. Interlocutor: If I eat the meat of an animal that has this illness Can I also be infected? Ruanel: If the virus is active with all certainty yes. Interlocutor: In these moments what are the terrestrial scientists doing to fight against this disease? Ruanel: They are proving with diverse vaccines but not with the genome. Interlocutor: This means that they cannot solve it. Interlocutor: Is there something else about this? Ruanel: Not at the moment. Interlocutor: How is the vessel to continue? Ruanel: He is very tired because he has low pressure. Interlocutor: Can we finish the session here? Interlocutor: Well, Master, it will be until the next time and thank you. Ruanel: I leave to you my Light. This entry was posted at Monday, May 04, 2009 and is filed under Extraterrestrials . You can follow any responses to this entry through the .